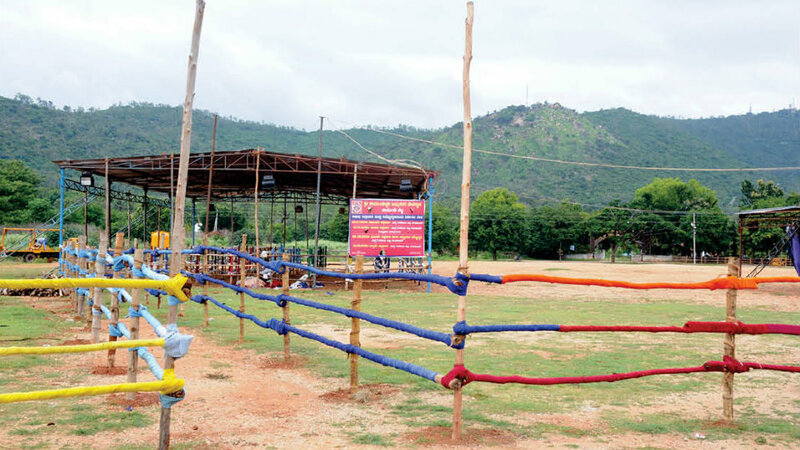 Mysuru: With the Ashada Month having commenced, the City Traffic Police have imposed certain restrictions on vehicles plying to Chamundi Hill on Ashada Fridays — July 20, 27, Aug. 3 and 10 — for ensuring smooth traffic flow and public safety. 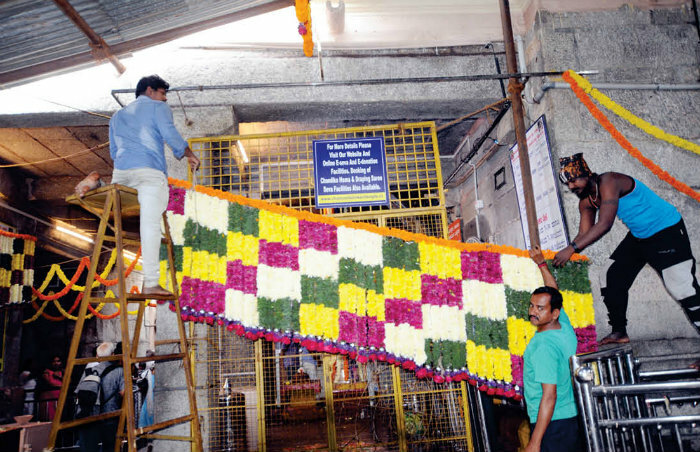 Floral decoration in progress at Chamundeshwari temple. The devotees visiting Chamundi Hill will have to park their vehicles at Lalitha Mahal Helipad as is the practise for the past six years and travel to the Hill temple in KSRTC buses arranged by the District Administration. The free bus facility from the helipad to the temple will be available from 2 am to 10 pm on all the four Ashada Fridays. The vehicles carrying ‘prasada’ should be parked at the parking space opposite the bus stand atop Chamundi Hill. Only those ‘prasada’ distribution vehicles which have been issued passes by the District Administration will be allowed. VVIP, VIP and media vehicles travelling to the hilltop must obtain passes from the Office of the City Police Commissioner. Such vehicles have to be parked at slots 2 and 3. Also, movement of all types of vehicles have been banned on the stretch from Mahishasura statue to Chamundeshwari temple. The barricaded entrance for Rs. 300 special darshan. Movement of all types of vehicles to the hilltop has been banned from 10 pm the previous night (on Thursday). Residents atop Chamundi Hill will have to get passes for their vehicles to ply from Chamundi Hill Gram Panchayat office by producing DL and other vehicle records. Specially-abled and aged persons visiting the Hill will be ferried in battery operated vehicles from Mahishasura statue to the temple. Government vehicles and Police vehicles arriving atop the Hill for bandobust duties should be parked at the slot near Devikere enroute to the Hill temple. 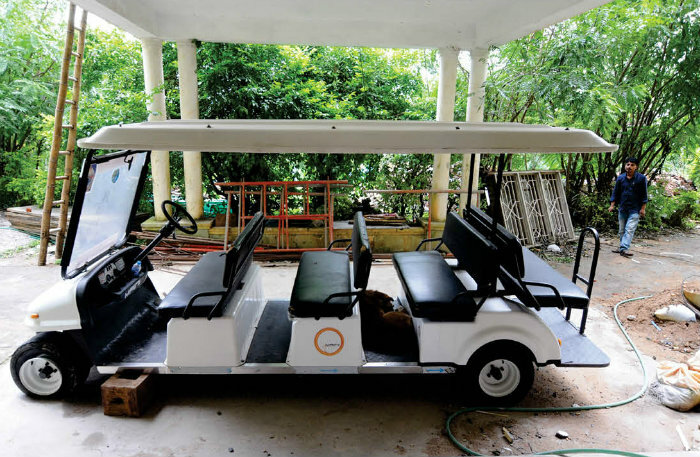 Battery-operated vehicle to ferry specially-abled devotees. Movement of vehicles has been banned on Chamundi Hill Road from Uttanahalli side too. As part of security measure, CCTV cameras will be installed in the temple. Also, a helpline will be set up at the temple for the benefit of devotees. There will be adequate security at the vehicle parking lot in the Helipad. 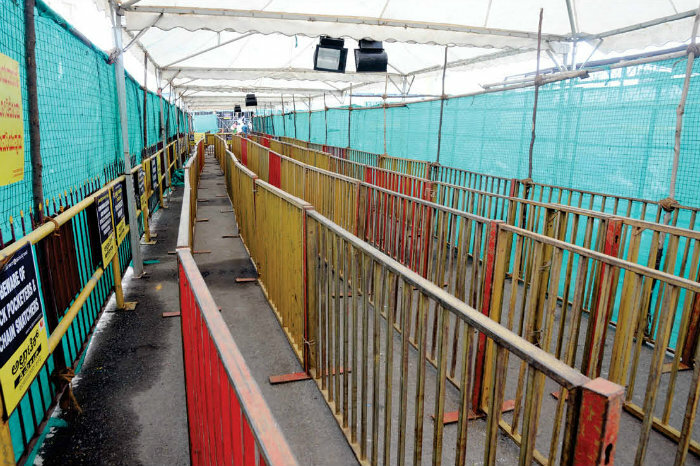 Also there will be toilets, emergency medical facility, drinking water, street- lights at Helipad and the devotees can have darshan of the deity without any worry, after parking their vehicles at the stipulated parking facility, according to a press release the Office of the City Police Commissioner.